In Siege, the emperor Constantine pushes through the Union of the Catholic and Orthodox churches, hoping to receive aid from the West. However, his push for union only divides his people, inciting the Greek monk Gennadius to do whatever it takes to keep union from occurring. While the role of Gennadius is somewhat exaggerated in Siege, there can be no doubt that he was a stubborn foe of union. There can also be no doubt that the struggles over union played a key role in the fall of the city. Successive emperors pressed hard for union, gambling that the aid it brought would offset the dissension it bred. But their gamble did not pay off. Despite the Pope’s call to arms, very little help came from the West. The Union served only to embitter and divide the people of the empire. The Union was an attempt to bridge a divide between Rome and Constantinople that had been centuries in the making. The schism between the Catholic and Orthodox churches had its roots in politics, theology, and culture. The origins of the break can be traced to 395 AD and the death of Theodosius, the last emperor of a unified Roman Empire. After Theodosius, Rome split permanently into two empires, one ruled from Rome and the other from Constantinople. The two quickly grew apart. Latin remained the dominant language in the West while Greek eventually became the language of the East. In the West, Rome was overrun by Germanic tribes, who had a huge impact on the development of Christianity there. As Roman political power faltered, the Church increasingly took over a political role, and the Pope emerged as the most powerful secular ruler in the West. In the East, the empire continued to thrive. Constantinople was a powerful, affluent city. The Patriarch remained a religious figure, more concerned with the purity of doctrine than with the political and logistic troubles that occupied the Pope. The theological differences that divide the two churches seem arcane enough, but to theologians they were important. The origin of the split revolves around a portion of the Nicene Creed known as the filioque doctrine (filioque is Latin for “and the son”). The original creed, agreed upon in 381 AD at the Council of Constantinople, read as follows: “We believe in the Holy Spirit, the Lord, the Life-Giver, Who proceed from the father. With the Father and the Son, He is worshipped and glorified.” In 589 AD, the Third Council of Toledo, amended the Nicene Creed to read: “We believe in the Holy Spirit, the Lord, the Life-Giver, Who proceeds from the father and the Son. With the Father and the Son, He is worshipped and glorified.” This new version of the Creed eventually spread to all the western churches. It was rejected in the East, most notably by Patriarch Photius, who in 867 AD excommunicated the Pope for supporting the filioque doctrine. Nevertheless, the doctrine continued to gain support in the West, and in 1014 AD, it was proclaimed as official Church doctrine. The filioque doctrine helped to justify the split of the Church and to prevent reconciliation of East and West, but the immediate cause of the schism revolved around Church politics. As their temporal power grew, successive Popes became more aggressive in their claim to universal jurisdiction over the Church. The Patriarch in Constantinople, on the other hand, argued that the Pope was merely one bishop amongst others, and that the Church should continued to be ruled by the heads of the five major patriarchates: Rome, Constantinople, Alexandria, Antioch, and Jerusalem (although in effect, Alexandria, Antioch, and Jerusalem, which were now in Muslim hands, had little say in the matter). According to the Patriarchs a council of bishops was needed to determine important doctrinal issues. In particular, the Patriarchs rejected Pope Benedict VIII unilateral alteration of the Nicene Creed in 1014 by the insertion of the filioque doctrine. There were also an increasing number of liturgical and practical differences between the Western and Eastern churches, and as the name of the Orthodox Church implies, the eastern branch of the church generally maintained the traditional position in opposition to innovations stemming from Rome. Important points of difference included the western introduction of unleavened bread into the Eucharist, the western practice of celibacy amongst priests (parish priest can be married in the eastern faith), and the eastern rejection of the worship of icons. Matters came to a head in 1054, when Pope Leo IX sent Roman legates to Constantinople to deny Patriarch Cerularius the title of Ecumenical Patriarch (i.e. a universal religious leader on par with the Pope) and to insist that he recognize the Pope as the head of all the Church. Cerularius refused and was promptly excommunicated by the head of the Roman delegation. Not to be out done, he responded by excommunicating all of the delegates. The schism between the Western and Eastern Churches had begun. Greek anger over the Latin sack of Constantinople in 1204 only heightened the divide. There were numerous attempts at reconciliation, including official declaration of Union in 1274 and 1439. This second declaration of Union is the one that Constantine finally had enacted in December of 1452, just before the Turkish siege of Constantinople started. The Union officially accepted the western doctrines of filioque and the supremacy of the Pope. If the people of Constantinople had managed to fight off the Turks and hold the city, then it is possible that this union could have held, and the Western and Eastern churches would be one, even today. But the city fell and with it all possibility of union. In 1484, the union celebrated in 1452 was officially repudiated. The schism became permanent, leading to the separate Catholic and Orthodox churches that we know today. Dinner that night was a small affair, held in the Pope’s private dining room around a table that accommodated only ten guests. The room was decorated on three sides with frescos depicting the deaths of saints, and the paintings seemed to come alive under the flickering candlelight. The fourth side of the room was lined with arched windows looking out on the lights of Rome, burning bright in the cold, clear February sky. The Pope sat at the head of the table with his guests of honor—Sofia and Filelfo—to his right and left. The rest of the guests were cardinals and bishops, and other than Bessarion, who sat to her right, Sofia did not recognize any of them. The meal itself was elaborate. The table was set with silver, gold, and crystal—a sharp contrast to the plain wooden dishes that served the Byzantine court—and the menu proceeded with course after course, each accompanied by its own wine. Seated between the Pope and Bessarion, Sofia could not help but join in their theological debates, even if all she could think about was whether or not the Pope would call the Synaxis’s bluff. They discussed the filioque, the main point of theological disagreement between the Catholic and Orthodox Churches. The Pope defended the filioque, an addition to the Nicene Creed made in the year 589, which stated that the Holy Spirit proceeded from both the Father and the Son. Bessarion represented the Greek Orthodox position, arguing that the Holy Spirit proceeded only from the Father. Sofia mostly kept silent, marveling that men could argue so passionately over a few words. When she said as much to Pope Nicholas, he smiled. “The what?” Sofia asked, not sure that she had heard correctly. “I see,” Sofia said, although she was not sure that she did. She understood the first part of the analogy well enough, but if the Spirit flowed through Christ to all mankind, then did that mean that the milk likewise flowed from the lamb to men? Clearly, that made no sense, unless perhaps one considered eating the lamb to be partaking of the milk. Somehow, Sofia did not think that Nicholas was suggesting they eat the Son of God. Or perhaps that was the purpose of the Eucharist? “Begotten, proceeds, what is the difference?” Sofia asked. “Yes, but the Spirit proceeding from the Father through the Son is not the same at all as it proceeding directly from the Son,” Bessarion pointed out. The two men laughed and then happily continued their debate, moving on to discuss Aquinas’s theory of spiration. As the evening dragged on with no mention of union, and fatigue from the long day of traveling caught up to her, Sofia’s mind drifted away from the conversation. She found herself thinking of Longo. She wondered what he was doing now; no doubt sailing back to Genoa with his young betrothed. She wondered what he thought of her after last night, and at the same time, wondered why she should care so much. She had never paid much attention to men. She had little reason to do so. Most of the men she knew were pigheaded fools who looked at her only as potential property. Why then this fixation with Longo? She would probably never see him again. Yet, she couldn’t help but think of him—his worn, handsome face; his strong, confident presence. She wondered if this was what falling in love was like. But how could she be in love with a man that she barely knew? Sofia blushed. “Something very like, yes your Eminence,” she murmured. “A great thinker indeed, though not without his faults,” Nicholas continued. “After all, God does not always obey the dictates of logic. Nor do men. Take, for instance, the Synaxis in Constantinople.” The Synaxis at last, Sofia thought. The blush faded from her face and all thoughts of Longo from her mind. They had reached the crucial point. “I could grant the demands of their letter—a letter, I might add, written without the consent of the Patriarch of Constantinople—but I fear that even that might not appease them. They are men ruled more by pride than reason, fueled by hatred rather than religion. And if they still refuse union, then I will have humbled the Church for nothing and perhaps ruined any chance of ever achieving a true union.” Assent echoed quietly down the table. Only Bessarion kept quiet. “If only I could be as sure as you are, Princess, that Emperor Constantine would indeed enforce the Union even over the complaints of his clergy,” Nicholas replied. “I have spoken with Leontarsis,” Filelfo said, speaking up. “In his absence, I feel confident in guaranteeing the Emperor’s support of the Union for him.” He gave Sofia a meaningful glance, and she offered a silent prayer of thanks for Leontarsis’s absence. He would have promised no such thing. Sofia smiled. Now that union had been secured, she would gladly discuss Aquinas, or any other philosopher for that matter. Perhaps she could not fight to defend Constantinople, but Sofia knew that she had done much more than that here in Rome. Helena would be proud of her she knew, and the Synaxis would be furious. In the back of her mind, Sofia could not help but wonder what Longo would think. Under Siege #23: History or Fiction? What is historical fiction? Is it history? Is it fiction? How real should it be? An aspiring author recently wrote me to ask just these questions. More specifically, he wanted to know two things. First, do I research as I write, or do I research before I start the writing process? And second, how do I deal with representing real historical figures in fiction; do I worry about putting words in their mouths that they may not (in fact probably did not) ever speak? I’m glad he asked, as this gives me an opportunity to elaborate my (drum role please…) Theory of Historical Fiction. First off, it is important to realize that there is no single style of historical fiction, any more than there is one type of pizza. Some people like deep-dish, while others prefer a Mediterranean style with a thin, crispy crust, or a New York-style pizza that is best eaten folded over on itself. A few (myself included, to my great shame) even enjoy pizza in its most capitalist form: Domino’s and Pizza Hut. Similarly, there is literary fiction that uses an historical setting (Ismail Kadare’s The Siege, Barry Unsworth’s The Rage of the Vulture, and Iain Pears’s The Dream of Scipio are three of my favorites) and genre fiction such as historical romances, historical action adventures, historical mysteries, and historical military recreations. And within each of these niches, the balance between history and fiction varies considerably. The first great practitioners of the art—Walter Scott and Alexandre Dumas—were not exactly slaves to historical accuracy. Dumas couldn’t even manage to be consistent within his own rather creative version of history. (Of course, consistency is hard to come by when you’re employing a team of writers as Dumas did.) Lately, the balance has begun to shift towards historical accuracy, led by writers like Patrick O’Brian, who have done a wonderful job of combining great historical detail with rousing stories. That said, the success of movies like Gladiator shows that the public still has a sizeable appetite for historical fiction that emphasizes the fiction. None of these styles of historical fiction are inherently any better than the others. I love Patrick O’Brian, but I also certainly feel that the world would be a poorer place without the works of Dumas, historical inaccuracies and all. And while novels that get history wrong can be frustrating, I sometimes find novels that strive for total accuracy to be a little pedantic. In the end, I think readers judge novels not by their accuracy, but their readability. Novels that tell a good story are forgiven for playing fast and loose with history, or even just plain getting it wrong. And no matter how accurate a book is, no one will care if it is not a good read. As Hayden White points out in his wonderful article “Historical Emplotment and the Problem of Truth,” even academic history is not immune to fiction. The narrative tropes that historians use to write history inevitably impose themselves on the facts, distorting and coloring the reality of the past. And even if an historian managed to somehow avoid this insoluble problem, historical reality can still never be fully recaptured. The weather, the smells, and most importantly all that goes on between the ears of historical actors can be recreated but never with certainty (otherwise historians would be out of work!). And this is precisely where historical fiction enters the picture: it uses fiction to fill in the myriad little details that history cannot supply. In novels, the author can tell us that the sun glinted off the barrel of a bronze cannon, without worrying about whether the sun was shining that day. Historians can speculate about why Brutus betrayed Caesar or why Napoleon invaded Russia, but historical fiction can go inside their heads and give us answers, albeit fictional ones. So fiction will always be part of historical fiction, and even real people—Caesar, Napoleon, Cleopatra, Jospehine—are necessarily fictionalized when they show up in novels. Even if every action a character takes is a faithful reflection of their actual life (or what we know of it), the character becomes fictional the moment the author gives us insight into what is going on in his or her head. This is all the more true the further back in history we go, because the worldview of people in the past was radically different from our own. For starters, most people never traveled more than ten miles from the place they were born. They had no notion of the scope of the world or the existence of different cultures. They had no real notion of historical change. Take a look at medieval or Renaissance paintings of scenes from the Bible: Mary, Joseph, Jesus, Noah, David… they are all dressed in doublets and hose. Medieval men and women truly believed that supernatural forces were active in their lives. And their world was composed of roles, not individuals: it was not uncommon to give five or six children the same name as their father in the hope that one of them would live to carry on his role. Their particular beliefs are strange to us. Until quite recently, it made perfect sense to take a child who died before baptism to the local priest and pay him to briefly resurrect the child so that he or she could be baptized, then buried. For the sixteenth-century Italian miller Menocchio (whose strange cosmology is beautifully captured in Carlo Ginzburg’s The Cheese and the Worms), the following explanation of the earth’s origins was self-evident: “I have said that, in my opinion, all was chaos … and out of that bulk a mass formed – just as cheese is made out of milk – and worms appeared in it, and these were the angels, and among that number of angels, there was also God, he too having been created out of that mass at the same time ….” To us, Menocchio sounds crazy. He was not. As late as 1870, the villagers of Hautefaye in France killed, tortured, burned alive, and perhaps even ate a young noble in broad daylight. These people were not crazy either. But they were very, very different from us. The great fiction of historical fiction, then, is that it almost always gives its characters a mentality that is at least partially modern. Some authors strive harder than others to recreate the mindsets of the past, but while they often succeed in relating the flavor and differentness of past mentalities, they almost never even attempt to go all-out. And this is a good thing! Re-creating past mentalities is perhaps the most challenging field of history, and authors of fiction are well-advised to steer clear, because if an author ever did capture the mindset of the past, they would only succeed in creating a character that modern readers could not relate to. In his Baudolino, Umberto Eco has perhaps gone as far in this direction as any author I have read. And unsurprisingly, Baudolino, while brilliant, is also rather difficult to read. All historical fiction, then, contains fiction. The question is how much, and that is up to the author. As for myself, I do a considerable amount of research to flesh out the historical context of my stories before I start writing. I embed my story in the chronology of the time and get to know the major historical figures that will appear in my book. When I write, I don’t change dates without a very good reason, and I tell my readers when I do so. I try to be as accurate as possible in relating background details of clothing, food, architecture, local customs, and even body-language; I typically do a lot of research on these things as I write. All of that said, for me the story always comes first, and this is, I think, the major difference between historical fiction and history, where the facts come first. I use historical fact to flesh out the story and make it feel real, but what I right is fiction. I hope you enjoy it! That is Genoa. In no other Italian city do they hand out free antipasti to tourists: this practice would bankrupt any restaurant in Rome or Florence. How can they get away with it in Genoa? Well, because there really aren’t very many tourists there. Genoa is a town given over to the locals. It doesn’t feature in many tour books, even the ubiquitous Rick Steves. And that is the best thing about the city. Even in the summer, the crowds are small. Genoa is a town of almost a million people, but it feels like a secret. It is also a great starting point to visit two of the great treasures of Italy: the town of Alba, which has some interesting architectural treasures, but more importantly is famed for its truffles and truly heavenly Barolo and Barbaresco wines; and cinque terre, five villages, each more lovely than the last, which are strung along the Mediterranean coast, occupying tiny inlets that are inaccessible by car. These days, not too much has changed, at least in the medieval quarter. The market square where young William encounters Carlo Grimaldi is still there next to the port. Today it is a good place to buy sunglasses or knock-off Bulgari and Gucci handbags. The old port was given a makeover for 2004, when Genoa was that year’s “European Capitol of Culture.” La lanterna, the old lighthouse built in 1128, still towers some 75 meters over the city. In addition, the port features a world-class aquarium, and it is a wonderful place to gawk at ridiculously expensive yachts, or to grab a drink and listen to yacht crews swap sailing stories. The Ducal Palace, upon which construction was started in 1291, still stands, although repeated renovations and additions have obscured the structure that Longo would have known. The Palace is now a museum, which is well worth a visit. I also suggest walking over to the Piazza di Sarzano, where William and Carlo dueled in Siege. The piazza is situated next to one of the old town gates and is overlooked by the San Salvatore church, with its strangely shaped stained-glass window. And of course, if you’re checking up on sites from Siege, you have to seek out the palaces of the Grimaldi and Giustiniani. 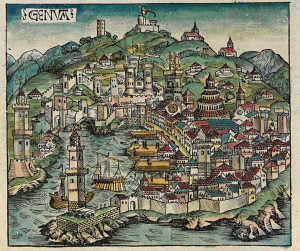 Back in Longo’s day, Genoa was ruled by powerful alberghi—clans formed when several branches of the same family bonded together. Leading alberghi included the Grimaldi, Adorni, Spinoli, Fieschi, Dori, and Fregosi. The Giustiniani—to whom Longo belonged—were actually not originally linked by blood; they were composed of shareholders of a company formed to colonize the Greek island of Chios. The palazzo Giustiniani sits, oddly enough, on the Via di San Bernardo, not the Via dei Giustiniani. The current building was built just after Longo’s time, but it occupies the same space. Likewise, the current palazzo Grimaldi was built in the early sixteenth century, but it nevertheless will give you some idea of the wealth and power of the Grimaldi albergo. All in all, the medieval quarter of Genoa is a rather lovely place. Walking its streets, it’s not hard to imagine yourself back in the fifteenth-century, when blood feuds were common and to walk the city streets at night was to risk your life. I would apologize for the length of time since my first Popped Culture blog, only it’s not really my fault. For the past month and more there just hasn’t been very much to write about. I could have blogged about the greatest cultural event in the history of the world—the World Cup—but I’m saving myself for when the games start. I could have written about Iron Man II, a surprisingly good film, but who hasn’t already seen it? The Losers was another surprisingly solid movie (despite a botched ending), but I have the feeling that no one is ever going to see it. Now at long last, after months without a worthy topic, Hollywood has blessed us with two historical adventures on the big screen: Prince of Persia and Robin Hood. Prince is based on a video game, has a plot that involves a dagger that turns back time, and stars Jake Gyllenhaal, who although he got a lot of action in Brokeback Mountain, is largely untested as an action star. Robin Hood comes from Ridley Scott, the director of Thelma and Louise and A Good Year (ok, ok, he also directed Gladiator, Kingdom of Heaven, and Blackhawk Down), stars action icon Russell Crowe, and is based on one of the most enduringly popular legends in the English-speaking world. Pitting these movies against one another is a David versus Goliath sort of contest. And David wins, hands down. Prince of Persia has its share of problems, but it manages to be something that Robin Hood never is: fun. The action is fresh and inventive. The sets are sometimes spectacularly silly, but they’re always spectacular. And the pace hardly ever slows. It’s the sort of movie that likes to tout itself as a “non-stop thrill ride,” and for once the label fits. What’s more, Prince has done the world an important service: after this film, no one ever need read Edward Said’s Orientalism again. Just watch Prince, and you’ll get the idea. The movie plays shamelessly to every eastern stereotype imaginable. And while this could be considered offensive, it is less damning in a film based on a videogame that has no ambitions whatsoever to historical accuracy. If Prince is historical in any sense, it is precisely in that it provides a sort of condensed history of clichés about the Near East. Giggling, scantily clad, seductive women in harems? Check. An evil, scheming vizier wearing too much eye shadow? Check. A ruthless bandit with a gold tooth who turns out to be good despite himself? Check. A society of assassins who command snakes with their minds? Ch… wait, huh? The amazing thing is that it all works. Yes, the plot is ludicrous and becomes more so as the film goes along, but the movie never betrays its own internal logic. Yes, the actors are archetypes—like chess pieces, we know exactly what moves they are capable of—but the director moves them about the board with a surprising amount of skill. And yes, there is nothing even remotely unexpected in the plot. Every “twist” is one that we have seen a hundred times before. None of that matters. Jake Gyllenhaal injects the film with such infections joy that nothing seems stale or old. Instead, the film offers the satisfaction of watching our expectations repeatedly fulfilled. There’s something to be said for this. It’s better than disappointing expectations. And that is precisely what Robin Hood manages to do. Ridley Scott set out to reinvent the legend of Robin Hood, and much of what he does makes sense. Placing Robin Hood within the larger context of the conflict between England and France is a good idea, as is the attempt to hew more closely to history. Unfortunately, this is also where the problems start. Normally, I’m not a huge stickler for historical accuracy in movies. Even more so than with historical novels, movies are about entertainment, not history. The imperatives of telling a good story can and should take precedence over factual accuracy. This is all the more true when dealing with a fictional character like Robin Hood. I fully support many of the changes made by the movie. For instance, Ridley Scott choses to portray Eleanor of Aquitaine, King Richard, and King John as extremely English, the antithesis of the oyster-eating, rather slovenly French king. In truth, Eleanor and her sons were every bit as French as King Philip of France. They were all raised in France, spent a majority of their lives there, and spoke French as their mother tongue. (After the Norman Conquest, the “English” crown did not publish its first official document in English until 1258.) But again, I have no problem with this change. No one—except maybe me—wants to watch a French Richard the Lionhearted. Other changes, however, are a bit more puzzling, especially considering that the new Robin Hood touts itself as a more “accurate” version of the old tale. There are two basic rules that all historical fiction, even movies, should follow: 1) if you are going to change history, have a good reason for doing so; and 2) stay clear of overly-fictionalizing big events that everybody knows about, or you will make yourself look silly. For instance, it’s probably not a good idea to make Robin Hood responsible for saving England from a French invasion, especially when that French invasion never actually happened. And it is definitely a very, very bad idea to make Robin Hood responsible for the Magna Carta, only the most famous political document in the entire English language. Thanks to Robin Hood, we now know that people from England to the United States to Australia owe the origins of their individual liberties to none other than Robin Hood and his philosopher-stonemason father (and yes, you read that last bit correctly). That said, Robin Hood is not a terrible movie. I was not upset that I spend money to see it. But nor was I particularly glad that I did so. It is one of those movies that seems much worse than it is because it is close to being so much better. Robin Hood does a lot of things right. The look of the movie is wonderful, and most of the changes made to the more standard telling of the tale work. Making Robin Hood a yeoman makes sense: they were the ones who fought as archers, not the nobility. Starting with the death of Richard the Lionhearted was a nice surprise, especially since it was more or less accurately depicted. And best of all in my opinion, the script borrows liberally from the tale of the French peasant Arnaud de Tilh, who in the early 16th century showed up in the Pyrenean village of Artigat and took over the life—including the wife—of the absent Martin Guerre. In the movie, Sir Robert Locksley of Nottingham plays the role of Martin Guerre, and Robin Longstride (aka Robin Hood) is the impostor, who at the behest of Sir Robert’s father and with the connivance of Marian, takes over the role of lord of Nottingham. This is a really good idea, which provides most of the film’s best moments. There is only one problem: in the end, Robin Hood completely blows it. The big question of the film is when and if Robin will be unmasked. Only one character knows his secret—Mark “I Only Play Evil Characters” Strong’s Sir Godfrey. I don’t think it will shock anybody if I reveal that Sir Godfrey dies in the end. Robin’s problem looks to be solved. But not so! A few scenes later, King John contorts his face and spews spittle while declaring Robin an outlaw for, amongst other reasons, having impersonated a noble. What? How did King John know this? We are never told. That’s kind of a big deal, since the scene where John learns that Robin is not who he claims to be is only THE MOST IMPORTANT SCENE IN THE MOVIE! This bizarre oversight is symptomatic of a bigger problem. Robin Hood is about thirty minutes too long. The fight scenes drag on for so long that they eventually become tedious; I lost interest about halfway through each of them. All this extra footage seems to have squeezed out some vital plot points. For instance, what—other than a really sour disposition—motivates the evil Sir Godfrey to betray England to the French? If it is power and influence, then why isn’t he satisfied when he becomes Lord Marshall of England? If it is money, then why does he let his henchmen steal all of the gold and jewels they capture when they ambush King Richard’s men? And speaking of these gold and jewels, which eventually find their way into the hands of Robin and his band, why weren’t they ever used to pay the taxes of Nottingham or buy the seed grain the town lacked? The biggest problem for me, however, was the relationship of Robin and Marian. The film does a fine job of showing us why she would fall for him. He is handsome, kind, listens to her problems, and helps to save Nottingham from starvation—all endearing qualities. As for why he loves her… well, she’s beautiful. That’s about it. She is established as a strong woman early on in the film, but Robin Hood is never around to see any of that. Even when she shows up at the end in armour to help turn back the French invasion that never actually happened, all she does is fall down in the surf so that Robin has to save her. So when Robin finally tells Marian that he loves her, it is far from convincing. And did I mention that she shows up in armour for the final fight scene? Not only is this ridiculous, but where did she find armour that fit her? In the end, Robin Hood damns itself by trying to be a little too historical and a little too original. Trying to tell the “true” story of Robin Hood turns out to be a bit of a fool’s errand since Robin Hood is, after all, a fictional character. Prince of Persia has no such problems. History, reality, and originality take a backseat to fun. Prince may not exceed expectations, but it does an admirable job of fulfilling them. And that’s good enough for me.